Lucy recently turned three months old (I still can’t believe it) and during that time, we’ve faced many feeding issues. She lost a lot of weight after coming home from the hospital and had to go straight back in to see the doctor. We learned that she wasn’t getting enough to eat and we had to start supplementing her meals with formula. Once that was figured out, she began to spit up. Then the spit up became more significant. The doctor thought she may have a food intolerance and suggested I begin by eliminating dairy from my diet. Easy enough right? I quickly learned that dairy is not only in a lot of my favorite foods (pizza, pasta dishes, sweets, etc…) but also food items I never imagined contained milk (bread, crackers, and some lunch meat for example). After some internet research, I found several great resources that provided lists of dairy-free food products and was able to easily change my menu. And I’ve even been able to indulge on some sweets. Did you know that Oreos don’t contain dairy? Neither does Pillsbury’s sugar cookie dough. I can still have warm cookies straight from the oven! After a few weeks, Lucy was better, but was still having occasional bouts of heavy spit up. The doctor then recommended that I try the elimination diet, which basically cuts out any possible allergen. For a week and a half, I ate nothing more than chicken, pears, potatoes, squash, rice and water. I was miserable, but Lucy felt great. I slowly started to add things back in to determine what was disagreeing with her. I am still dairy-free, but have not been able to positively identify any other triggers. It can be extremely difficult to see such a tiny little body heave out such exceptionally massive amounts of liquid. The other morning, 15 minutes before I needed to leave for work, she expelled an impressive arc of stomach contents that left her, me and the floor completely soaked. She got a bath, I took a second shower and the floor got a quick mop-down. But through it all, Lucy never stopped smiling. Although eliminating dairy wasn’t as difficult as I originally imagined, I am still looking forward to the day when she is able to tolerate it again (I’m keeping my fingers crossed that this is a temporary issue and not an actual allergy). I really miss pizza. And chocolate. And a glass of milk with dinner. And when I dug into the Found Recipe Box for recipes to post on the blog, I realized how many of them listed milk or butter as a main ingredient. 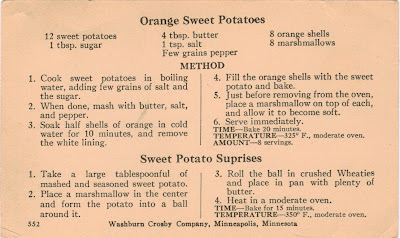 There was one, however, that stood out right away and I knew I needed to post it as a tribute to my stint on the elimination diet: sweet potato recipes. 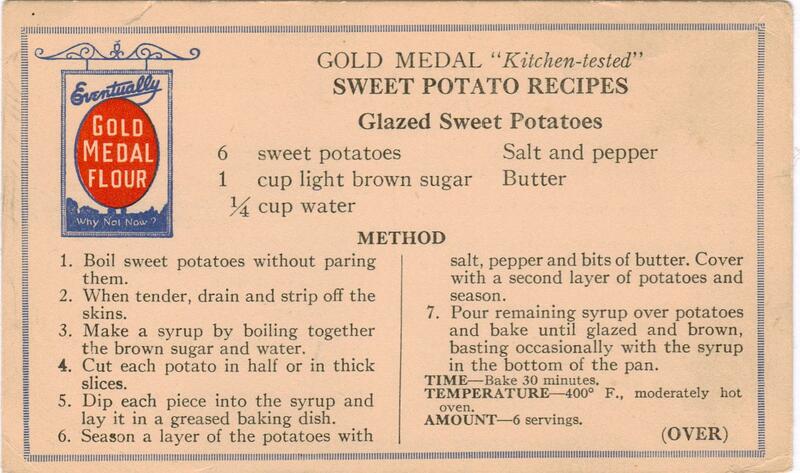 There are a few variations listed on the card, but I chose the glazed sweet potatoes. They resemble thick-cut baked sweet potato fries. It didn’t take long for the house to fill with the delicious aroma of the beautiful orange tuber baking with brown sugar…and smoke. I had placed the potato slices onto parchment paper in a metal baking dish. The paper, though, didn’t fit the entire bottom of the dish. Some of the glaze slid off the paper and onto the metal where it began to bubble and burn and turn into a material that resembled black Hawaiian lava rock. Thankfully it was nothing that a quick soak in soapy, hot water couldn’t fix. Once the smoke had cleared and we were able to sit down to dinner, we dug into the sweet potatoes and discovered they were delicious! In honor of the elimination diet, we also had squash, but swapped out the chicken for tilapia. The best part of this meal, though, was that it was in celebration of my very first Mother’s Day. This day has always been special because of how much my own mother means to me. But this year, as I gazed into the bright blue eyes of my beautiful baby girl, it gained a whole new meaning. Thank you Lucy and Ryan for making my very first Mother’s Day so incredibly special! I found several other recipes in the box that are dairy-free so I hope to have more to post soon. Otherwise, I guess I’ll just have to make the recipes for cakes and pies and give them away. Luckily, I think I know a few people who wouldn’t mind receiving the gift of a fresh-baked cake. Have you tried 'Silk' or rice milk? I personally don't care for the taste, but Silk is good for creamy things and rice milk is good in baking. Hope all things will clear up soon! 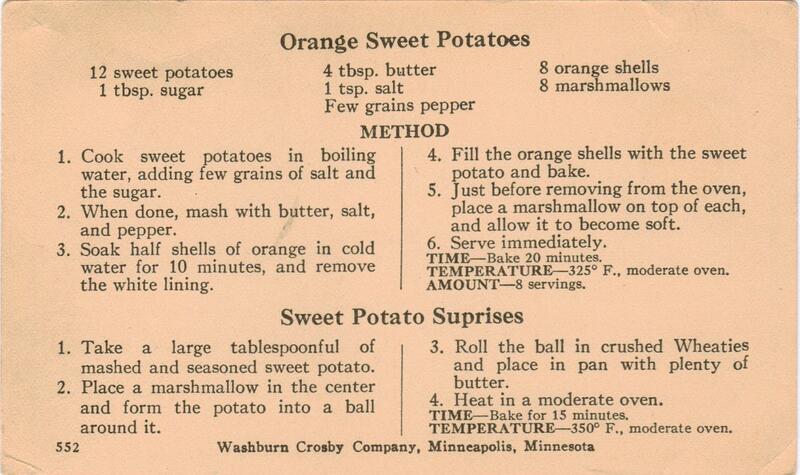 I love sweet potatoes, the pictures look good. Your little girl is beautiful! She's so cute. Poor little thing shouldn't have to suffer so much, and you either with the restricted diet and all the cleanup. I discovered your blog through GStaples' blog. I love your Found Recipe Box. 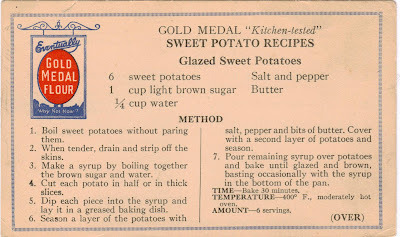 You said "My hope is for each recipe to find a new home (beside my own) where it can be shared and loved for many generations," and that is exactly what I am also trying to do with Vintage Recipe Thursday. I sure hope you will come by and link your recipes with my blog. I'm your latest follower. Sorry you've had such a difficult time trying to figure out what Lucy can eat. I am also sorry that you had to give up some of your favorite foods. I hope things even out soon.